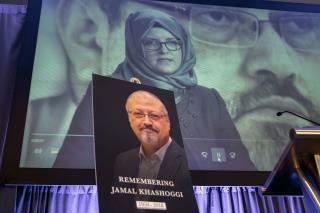 (Newser) – The Saudi consulate general's residence in Istanbul has long been a target of investigation into the murder of Jamal Khashoggi, and rightly so, alleges a new documentary by Al Jazeera Arabic. It claims, by way of Turkish officials, that the journalist's body was likely burned in what Vice News calls a "specially made" outdoor tandoori oven at the consulate general's Istanbul home. The burning allegedly occurred over a three-day span, after which large amounts of meat were allegedly cooked in the oven as part of a cover-up. Among those Al Jazeera interviewed was a worker who said he built the oven based on the consul's specifications; among them, that it be able to handle temperatures in excess of 1,800 degrees Fahrenheit, which syncs with the temperature needed to cremate a body. Why does the theme-song from the "Third Man" keep going through my head when I hear this man's name. Baked Khashoggi not very appetizing.